Many families still do not know that since Jan. 1, 2000, every armed forces veteran and member on active duty or in the active reserve has had the right to be buried with patriotic flourishes provided by a military honor guard. On that date, Military Funeral Honors became a statutory benefit to all veterans with the signing of the National Defense Authorization Act. 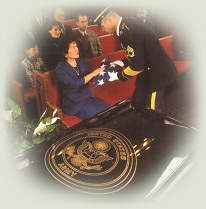 The law requires that, upon the family's request, every eligible veteran is entitled to receive a military funeral honors ceremony to include folding, presentation of the United States burial flag and the sounding of taps, at no cost to the family. In addition, as opposed to a CD used to play taps, a not-for-profit organization Bugles Across America will even provide a uniformed bugler to play a live rendition of taps in recognition of the service these Veterans have provided to their country. The complete statutory benefit can be found in United States Code. Several states have also enacted legislation to provide military funeral honors using members of local veterans' organizations and members of the National Guard - establishing honor guard teams. The only catch is the veteran must have been discharged or released from the service under conditions "other than dishonorable." Funeral directors are fully familiar with the term "DD214" and the document requirements for this benefit. The "DD214 form," or other substantiating evidence must be produced by the family. The funeral director is responsible for obtaining the required documentation (NGB 22 or DD214) from the next of kin to determine if the deceased veteran is eligible for military funeral honors. "The only time we have people unhappy is when they can't prove their relative was honorably discharged," said George Compton, veterans service officer for California's Ventura County's Human Services Agency. "They will not get an honor guard. "If they can't find the DD214, they can check with Veterans Affairs," Compton said. "If the veteran had made a claim with the VA, then the VA has data and can verify if the veteran was honorably discharged. If he didn't file a claim with the VA, they will not have his records. Then the family will have to go to the military records center in St. Louis and that could take up to two months, too late for the funeral." What is apparently unknown to Mr. Compton is that another option exists for the prompt acquisition of a veteran's DD214: certain independent National Archives' researchers specialize in military records, and can frequently acquire a veteran's DD214 overnight, or in a day or two. We discuss this option later on, at The Best Method to Acquire Your DD214. However, when time is not an issue, Compton recommends that families pre-plan the veteran's funeral and locate and/or otherwise acquire the veteran's papers while he or she is still alive. Also, if predeath arrangements have been made with a funeral home, a copy of the DD214 should be given to the funeral director so it can be placed in the veteran's file. With the DD214 on file, if a family wants an honor guard for a loved one, all they have to do is call the funeral home or mortuary and the staff will contact the military and make the arrangements. Typically, an honor guard is made up of active duty or reserve personnel from the branch of service the veteran served in. However, if that's impossible, honor guard members may be drawn from other branches or from military veterans' organizations such as the Veterans of Foreign Wars. Your funeral director can provide specific details.